You asked for it, you got it. The Solaris® is now available in a 12 minute session, to meet all of your clients' needs. 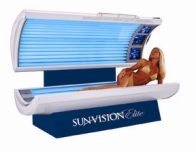 With high power, 160 watt lamps in the canopy, your clients will love the comfort, power and beautiful, long lasting tan they expect. You can also apply by phone at 866-300-2070.